German Chancellor Angela Merkel on Monday said she wants to win back the voters who deserted her party for Alternative für Deutschland (AfD) which made history in the national election by becoming the first far-right party to enter the country’s Parliament in almost 60 years. Merkel is now set for a fourth term in office but centre-right Christian Democratic Union (CDU)-led alliance took 33 per cent of the vote in Sunday’s election — its worst result since 1949 but enough to remain the largest force in Parliament. Her bloc must now embark on a series of negotiations in order to form a functioning government using its 246 seats as leverage, BBC reported. 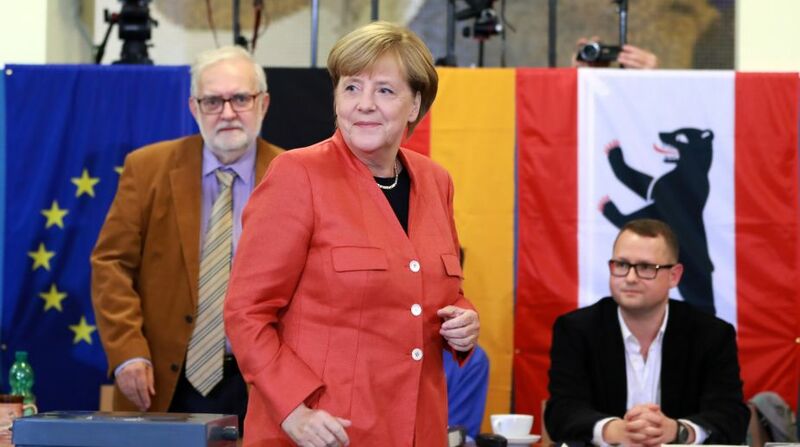 The centre-left Social Democrats (SDP) — Merkel’s government partners since 2013 in a “grand coalition” — also suffered their worst post-war result, taking 21 per cent. Martin Schulz, leader of the SDP, ruled out another coalition with Merkel. He said his party will enter into the opposition, meaning Merkel may be forced to seek cooperation with the liberal Free Democratic Party (FDP) and the Green Party. Both the parties took 10.7 and 8.9 per cent of the vote, respectively. The AfD secured 13 per cent, marking the first time in almost six decades that an openly nationalist party will enter the Bundestag. The party on Monday vowed to fight “an invasion of foreigners” into the country. Long-standing splits inside the party emerged on Monday when its chairwoman Frauke Petry said she would not join the AfD’s parliamentary caucus, walking out of a news conference. On Monday, Merkel said she had wished for a better result. “We have started to analyse the voters we lost, especially with regards to those who went on to vote for the AfD, we want to get them back,” Merkel said. Merkel said her party would speak to the liberal FDP and the Greens, “but also the SPD, as we governed together for a long time”. However, SDP leader Schulz denying any coalition, accused Merkel of operating “sleeping pill politics” which “allowed a vacuum to develop which now other parties have capitalised on”. He was referring to the unexpectedly large numbers of AfD MPs that have been elected. The party, which only formed four years ago, is expected to take 94 seats in the 709-seat federal Parliament as the third-largest grouping. AfD’s campaign capitalised on a backlash over Merkel’s decision to open Germany’s borders to undocumented migrants and refugees in 2015. Its success shocked Germany’s political establishment and protests against the anti-Islam party were held following the election result. Talks between the parties, which will also include the CDU’s Bavarian sister party the CSU, could last until after Christmas and risk triggering fresh elections if they collapse.